Today i went Canyoning into the Canyon called “chli Schlieren” with Nina, Jacky, Claudsche, Peschi and Sigi! It was unbelievable cool. It’s so nice to be in the river, slide and jump down the rocks into pools and stuff like that. Mänu and Lüku were both great guides (i know both of them from school). If you’re in switzerland, and have nothing else to do, go to Interlaken and do that! 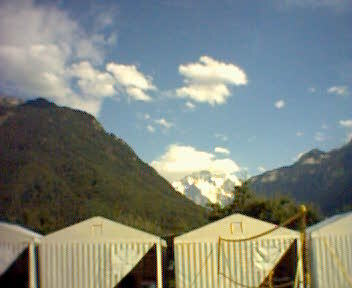 The picture here shows the view from the base of Outdoor Interlaken to the Jungrau Region. Comment for some other Blog-readers (B. and Miklos): We drove from Interlaken over the Brünig and passed through Lungern, how funky is that? Surprised? Checked out the site of Arni and found your address:-) Hope you’re doing fine? Well, got to go to bed now…höhö. Take care and we’ll c us around.